This is for Discussions about Napoleonic History only. Nelson boarding the San Josef with his famous patent bridge at the Battle of Cape St Vincent. Nelson receiving the surrender of the San Nicolas at the Battle of Cape St Vincent. Nelson in conflict with a Spanish launch at Cadiz (1797). The distruction of L'Orient at the Battle of the Nile. Nelson coming on deck at the Battle of the Nile. William Shakespeare, Henry V, IV, 3. Once more unto the breach, my dear friends, once more. Or close the wall up we our English dead! William Shakespeare, Henry V, III, 1. Field Marshal Bl?cher wrote: Is that bottom one Lannes? That is Antoine Lasalle, one of the best cavalryman of his time. Legless Lannes wrote: That is Antoine Lasalle, one of the best cavalryman of his time. Oh, I knew I'd seen that guy somewhere. Thanks. "the generals are the problem in our army"
King's Own Royal Foot Guards, 1st Division, color sergent. 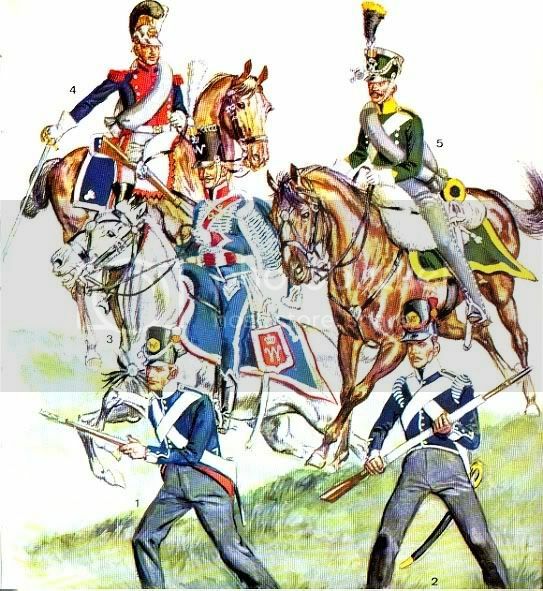 General Dezlons with infantry in the Battle of Maloyaroslavetz, Russia, 1812. Picture by Avierianov. I think that piece was made by the wonderful artist Mariusz Kozik aka Lacedemon. His website which also has a email contact.